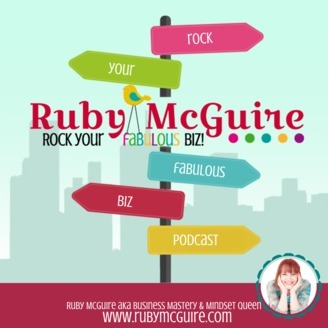 A podcast show with a fab and fun approach to all things business from me, Visibility Diva, Ruby McGuire. 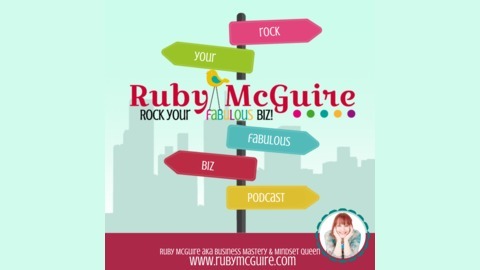 Get ready to rock visibility in your fabulous biz with lots of fun, inspiration and actionable nuggets sprinkled in along the way. We'll be covering all sorts of things from self-care to niching, marketing, confidence and so much more, all to help you to stop hiding your fabulousness and share your business on/offline. Do you find that sometimes you're super productive and then other times there seem to be a million and one things drawing your attention in different directions? Maybe your distraction is checking in on emails, you can't avoid those little red pop up notifications catching your eye, or you get caught up in social media. I have a mantra for this year: "Make the plan. Stick to the plan!" It's way too easy to get sucked into other projects/opportunities that take you away from your overall goals. I've had a few things that have really helped me keep control over what I'm doing. 1. I read The One Thing by Gary Keller - a fabulous book. No guesses for what the focus is on in this book! You could argue that you don't need to read it really as it's just all about focusing on one thing, however, it's totally worth a read. It really shifted my thinking around how I work day to day 2. I read another book called The 12 Week Year by Brian Moran - This was a game changer for me. It's basically where your work year is divided into 12-weeks. Now I can't get my around there being 4 years in 1 year that they talk about in the book, but I do work now in 12 week blocks. I LOVE the short, sharp focus of goal setting and focused projects during that time. Week 13 is for review. As a result of all of the above I create super strict boundaries for my work now. I only work on 3 different areas at a time; 2 business and 1 personal usually. If you want to get ahead in your business here's a super simple 7-step strategy to keep that focus: 1. Spend some time planning Plan out what you'd like to achieve in 12 weeks (If you're not sure what your goals are check out my Coaching Tools Company blog post where I share how to create goals in 90-minutes or less. 2. Decide what your top 3 priorities are and work in 'Espressos' - My version of sprints If you've not heard of sprints, they are where you set really clear goals for a 2-week block of time, and then take action to achieve them. Having short blocks to work within keeps the motivation and momentum going, rather than feeling overwhelmed. I personally don't call them 'Sprints'. I'm not really sporty, and I like coffee so mine are called Espressos of course! Thanks to Sophie Jewry for coming up with that name for me! I also find it a bit challenging doing a 2-week block as I find I do less in week one and then panic in week 2 where I'm so behind lol, so my Espressos are all a week each. 3. Each day decide what your top 3 priorities are (Your MITs - Top Most Important Tasks. I learned about these from Leonie Dawson many years ago, but I think they might have originated from Stephen Covey. Let me know if you know the original source. Always make sure your 3 priorities help you achieve your overall 12-week plan. 4. Block out time in your diary for each of those 3 priorities and work ONLY on those priorities. I learned about time blocking many years ago from my friend, Geraldine Kelly Once you've hit your 3 priorities you can move onto the next ones. 5. Add in a buffer for unexpected eventualities We can't always guarantee something won't come up so add in some buffer time (and no, that buffer time is not for you to watch more cat videos on Facebook, teehee!) Getting really good with your boundaries will help you with this one though. I've got lots of articles over on my blog around boundaries. -Are You Being Wishy Washy With Your Boundaries? -3 Ways To Say No To People Who Want To Pick Your Brains For Free 6. Review your progress at the end of the day. What worked? What didn't? What can you do differently tomorrow? 7. Spend a few minutes planning out your next day It's way too easy to get distracted at the start of a new day. By planning in advance you're ready to hit the ground running. If you decided to have a play with this super simple 7-step strategy to help you keep your focus, let me know how you get on. I'd love to hear from you. If you want to know what it's like to work with me 1:1, book a Crack-It Call where I'll work with you for 20-minutes to help you crack one area of your business. You'll be amazed at what we can resolve in just 20-minutes together. Find out more here. PS links mentioned on the blog/podcast may be affiliate links, but that I only share when I totally LOVE something and have personally used it myself.